It's crazy how fast the summer flew by, I feel like I was just coming home from school and now I start classes one week from today. The weather when heading back to school can definitely be tricky, it's the end of the summer so it's either going to be crazy hot or starting to cool down, and by this point I'm usually over summer clothes and craving something a little more fall. At this time of the year I like to have a few easy dresses and rompers in rotation to throw on when it's warm out; I'm loving this simple shift dress for just that and the best part is it comes in six different colors so you have great options. It's also good to have a pair of jeans on hand for if it gets cooler out, when I'm purchasing jeans Mavi is my go to brand because they fit well and are super comfortable. To pair with your jeans (and shorts) you'll need a few cute tops and this one by TopShop is adorable with its scallop detailing. As far as shoes, having a few pairs of sandals (try to get in wearing them while I can!) and flats are a necessity for me, I usually alternate the two until it's too chilly for sandals and then stick with flats until it's time for boots. For accessories I'm really into studs right now and am obsessed with this Kendra Scott pair, I also always have to have sunglasses and am super into a cateye style right now. Anyone in school knows that they need a bag large enough to fit all the school essentials, but that is still stylish, I use this Longchamp bag in navy, but have my eye on the black leather tote from Nordstrom. These few style pieces will definitely help you head back to school and transition into the late summer/early fall. What pieces are you loving for this time of year? Everything here is a MUST have for sure. I love the color scheme you picked our and accessories. Hard to believe school is back in session and fall is just weeks away. I would love to invite you to my weekly link up that goes live every Tuesday at midnight (EST). Every Tuesday I feature my favorite 5 bloggers/fashionistas from the previous week. I would love to have you stop by. 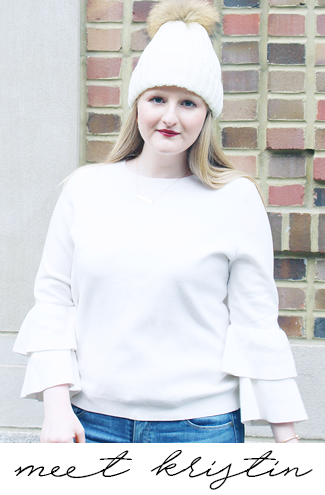 Wearing that scalloped top in today's post but in white! I swear I wear it like every other week! Great picks, Kristin! 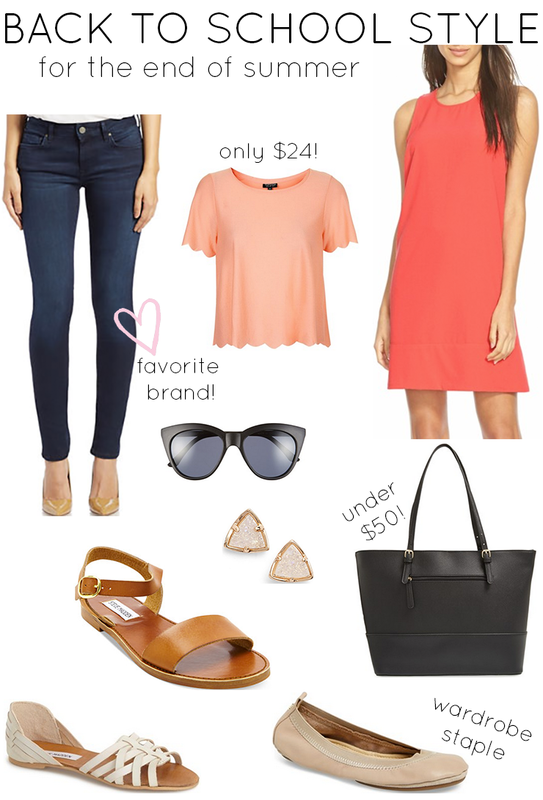 I absolutely love those Kendra Scott earrings and coral dress. One of the characters on PLL wore those studs recently and I recognized them right away! Kendra Scott's designs are so distinct. I love it!